Just days after Kamal Haasan confirmed that he would enter politics and launch his own party, Tamil star Rajinikanth’s friend Tamilaruvi Manian has made it clear that ‘Thalaiva’ must join hands with the ‘Vishwaroopam’ actor if he wants to make an impact in politics. He also stressed that both stars have a similar perspective/ideology and could change the political scenario of Tamil Nadu. “It will be good if Kamal Haasan works with Rajinikanth. If everyone has different parties and different flags, it will only create a possibility of Dravida Munnetra Kazhagam coming back to power. Rajinikanth is saying that system has failed and Kamal Haasan on the other hand is saying that I spoke about the failing system before Rajinikanth did; they both have the same goal. What is the reason behind the system failing for the last 50 years? The answer is the two Dravidian parties. 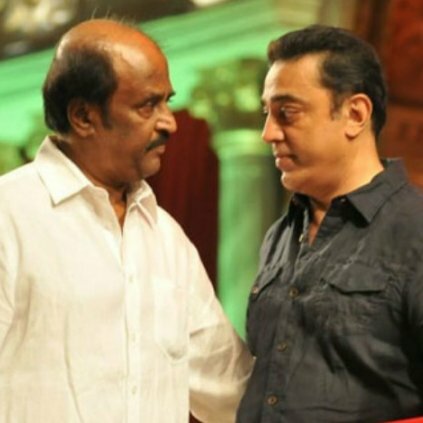 So, for a change from the two Dravidian parties, Kamal Haasan should join hands with Rajinikanth,” he added. Well, this is quite a bold statement and is bound to create a buzz amongst fans. On a related note, both men are currently busy with their professional commitments. Kamal is busy hosting ‘Bigg Boss Tamil’. On the other hand, Rajinikanth is currently shooting for the eagerly-awaited ‘Kaala’. A crime-drama, it is being directed by Pa Ranjith and features Rajini in the role of a gangster. Besides this, he also has ‘2.0’ in his kitty. The film is a sci-fi thriller and will hit screens in January 2018. What good is it, if we the people are still in the stone age with our age old mentalities. The place where we live might be transformed into Singapore or even Dubai/USA. But for long long will that be? Depends on we citizens. The way we speak to each other, way we keep clean, way we are willing to yield to others, the way we think about others. No more movie star politicians needed for Tamilnadu,the people of Tamilnadu must take a cue from Andhra Pradesh chief minister Mr.Chandrababu Naidu who is developing Andra Pradesh into a Singapore.